I’m a rookie when it comes to Sushi but I’ve been climbing the ranks fast by trying sushi every chance I get. Everybody told me to start with the philadelphia (philly) roll; rice, cream cheese and cucumber rolled inside of seaweed. Sounds simple enough. I’ve also made these and added shredded carrots and avocado as well. Very tasty. I still LOVE getting the Philly roll when I go out but honestly I prefer my homemade version which uses smoked salmon flavored cream cheese. #YUM!!! The sushi rice is well seasoned with vinegar, salt, and sugar. I really hate bland tasting sushi rice and I’ve noticed only a few sushi joints take the time to season the rice. Making homemade sushi is so easy and there is something oddly relaxing about it. Or maybe it’s just that I tend to make sushi when I’m home alone on rainy days with nothing else to do. It’s total comfort food to me and since my hubby & son hates it, I don’t have to share. I can see a sushi party with my favorite divas in the near future. I just have to convince them that all sushi doesn’t have to have raw fish in it. 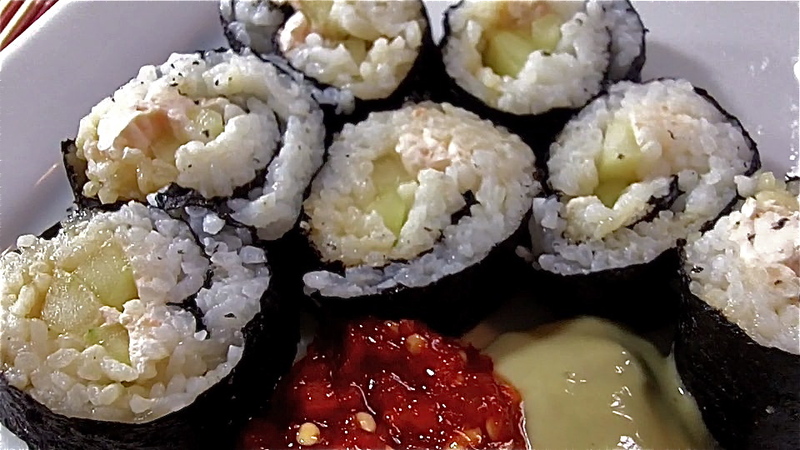 Watch me make these bangin’ Philly Sushi Rolls from start to finish!!! Rinse the rice several times until water runs clear. Add cool water to a pot. Bring to a very light simmer over medium heat. Cover and cook on medium low heat for 10 minutes. After 10 minutes, reduce the heat to low and cook for another 10 minutes. Do not remove lid. Remove from the heat and let it sit for 10 minutes. Do not remove the lid. Add rice vinegar, sugar and kosher salt to a saucepan. Heat on medium until sugar and salt has dissolved. Peel, seed and slice cucumber into thin slices. Set Aside. Pour the rice into a glass dish and pour in the seasoned vinegar. Stir to combine and fan the rice to cool it down. Cover a bamboo mat with saran wrap. Place a nori sheet on top. Prepare a small bowl with some water and rice vinegar to keep your fingers moist while spreading the rice if needed. Use a wooden spoon or your fingers to place the rice on top of the nori sheet. Smooth it out to make a thin layer of rice. Lay on 3-4 strips of cucumber about 2 inches from the edge, followed by thin strips of salmon cream cheese. Add wasabi sauce and drizzle on some soy sauce. Roll it up tightly. The bamboo mat will make rolling easier. Seal the edges with a little rice vinegar water if needed. Let the finished rolls sit for about 10-15 minutes. Slice the rolls with a serrated knife. Serve with various sauces and enjoy. I enjoy your recipes and the love the videos. God certainly gave you a vision. Keep doing what you are doing. Divas really can cook! May sound stupid but can I eat these while im pregnant or is the wrap made of fish? What type of sauces do you use with the sushi rolls? We have a Japanese restaraunt here in Austin, TX that makes great Philly sushi rolls with smoked salmon, cream cheese & advocado!! Not much of a sushi lover but love these! !